Goodreads: After taking a bullet for his commander-in-chief, Secret Service agent Joseph Reeder is a hero. But his outspoken criticism of the president he saved—who had stacked the Supreme Court with hard-right justices to overturn Roe v. Wade, amp up the Patriot Act, and shred the First Amendment—put Reeder at odds with the Service’s apolitical nature, making him an outcast. Is a mastermind mounting an unprecedented judicial coup aimed at replacing ultra-conservative justices with a new liberal majority? To crack the conspiracy and save the lives of not just the justices but also Reeder’s own family, rising star Rogers and legendary investigator Reeder must push their skills—and themselves—to the limit. Kritters Thoughts: Although Supreme Justices make controversial decisions, they aren't completely entrenched in the scandal and drama of DC; instead they are nicely tucked away! 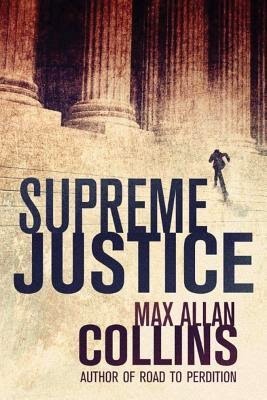 This fantastic piece of fiction brought the Justices to the forefront and both humanized them and showed the way they can be at the center of political drama. As I live outside of DC, I am always drawn to books that are set in DC, but also show the surrounding area - the DMV (DC, MD and VA) as we like to call it. Max Allan Collins allowed this story to really use the surrounding neighborhoods and had them come alive in the story. I absolutely adored the truth in how many police agencies are located in the DC area and getting them to work together as a team to one goal doesn't always end in timeliness! I like to do a little research after I read books, so much to my surprise I found Max Allan Collins large body of work after reading what I thought could be a debut. Have you read any of his other books? Any other great DC works that I should buy and read next? I live in the DMV as well so I understand the appeal of DC-based stories.